On Friday, April 6th, winners of the 2018 Creative Prizes and friends gathered in the President's Dining Room at Fordham Lincoln Center for a celebratory dinner. 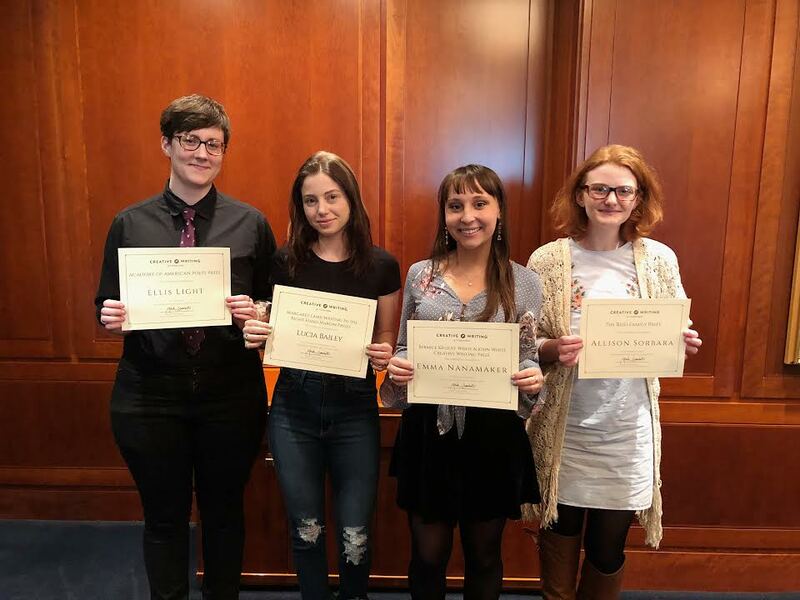 The 2018 Creative Writing Prize winners, Ellis Light, Lucia Bailey, Emma Nanamaker, and Allison Sorbara (left to right). The writers also read excerpts from their winning pieces. Bailey read from her winning piece, "An Excerpt from the Portrait of a Girl," Light from their winning poem, "Ring of Salt," Sorbara from her winning piece, "Cobblestone Streets," and Nanamaker from her winning poem, "Wild Bill's Piano Festival." The prize winners discussed their most beloved books, plans to use their honorarium to invest in their writing, and shared their work over an Italian dinner. The Department of English congratulates the deserving winners of the 2018 Creative Writing Prizes, and thanks all writers for their submissions. It is events like these, and students like all those involved in this year's prizes, that make Fordham's Department of English the innovative and impassioned program it is. Newer PostFour amazing events--attend them all! Older PostHaben Girma to speak on "Disability & Innovation: The Universal Benefits of Inclusion"